Will the weather ever give us a break, we wonder as we sit on picnic tables in front of Tuolumne Post office sorting our resupplies. We are not alone in this predicament, other hikers agree that the weather so far has been rather unpleasant. Today, just like yesterday we start the day with hats and gloves on and bundled in several layers of clothing. 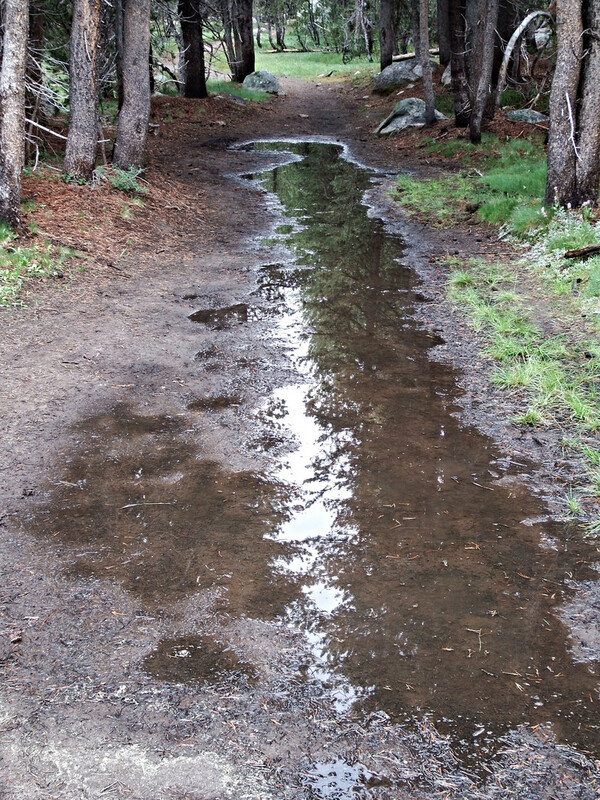 The trail is wet from the overnight precipitation and the possibility of more rain constantly looms above our heads. 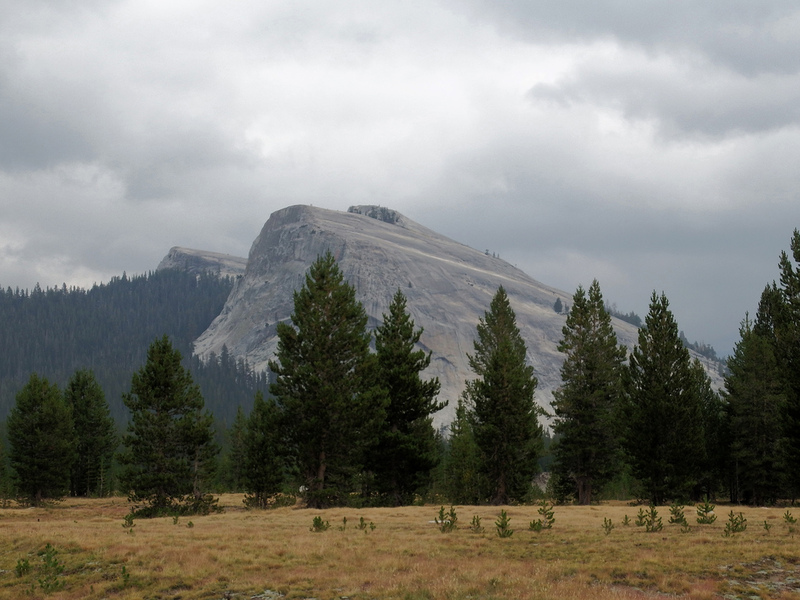 Curious to find out what the nature has in store for us in next few days we walk to the Tuolumne Ranger Station. The forecast promises more rain and even some thunderstorms to make things even more interesting. 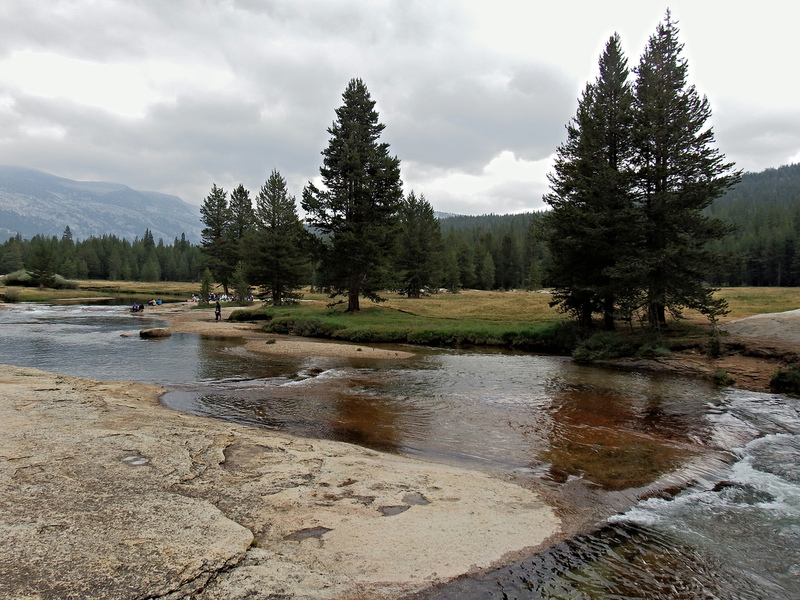 Tuolumne Meadows is about 5 miles of downhill walk from Lower Cathedral Lake where we spent the previous night. For JMT thru-hikers it provides the first opportunity to resupply. Hikers can either mail themselves a package ahead of time to the local post office or pick up necessities at a local general store. Not everybody feels the need to resupply as soon as a day 3 of their trip, some push onto Red’s Meadow which most hikers reach on day 5 or 6 of their journey. We decided to take advantage of all the resupply points along the way in order to keep our packs as light as possible so now we sit here with others who had the same idea filling our bear canisters and bickering about the weather. The East Coasters, Dave, Irvin and Eric are sitting at a table next to us, and we also meet several new hikers here. We are set and ready to continue our hike in about an hour an half after arriving. It’s longer than we anticipated, some of the delay can be attributed to the post office that only hands out the resupplies on the top of an hour which in our case meant 20 minute wait, the rest was spent chatting with fellow hikers. Emily who is hiking with her two friends decides to join us on a hike through the meadow while her companions take a shorter route along the road and we enjoy a very nice talk with her along the way. 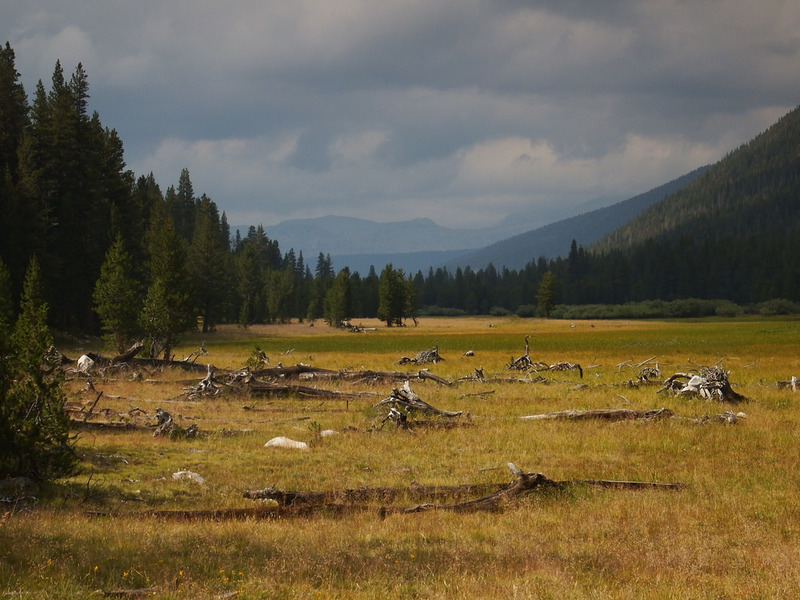 Tuolumne Meadows is said to be a beautiful area of which we only get a little sampling while walking surrounded by clouds. Several smaller features nearby are visible such as Lembert Dome, and it would make a great side hike if we had the time. And as we walk through the meadow, the clouds part and the sun touches our faces for the first time in the high Sierras, and even though it is only a brief moment and then the clouds conceal the sun again, it instantly lifts everybody’s mood. 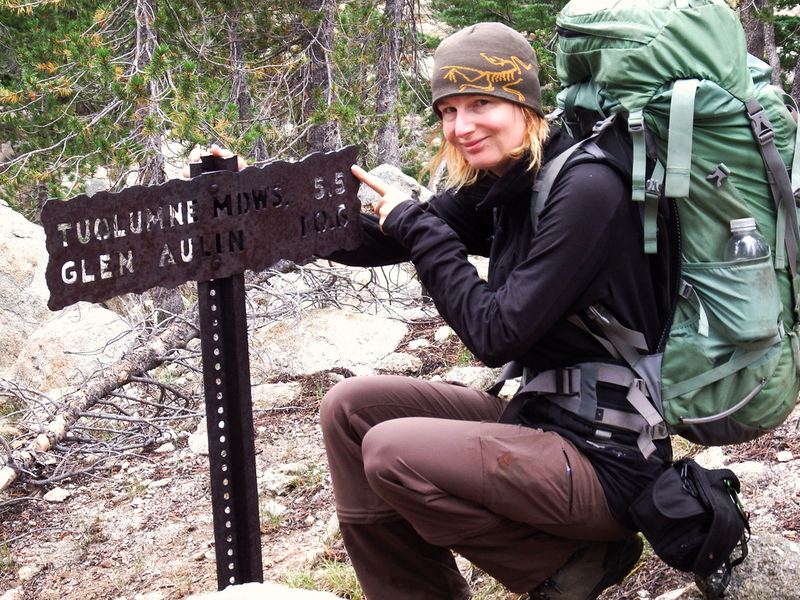 Emily leaves us at the intersection with Tuolumne Lodge where she gets reunited with her friends. We say goodbye knowing that with similarities in our itineraries we might see each other again soon. From there we walk on rather flat trail towards Lyell Canyon. 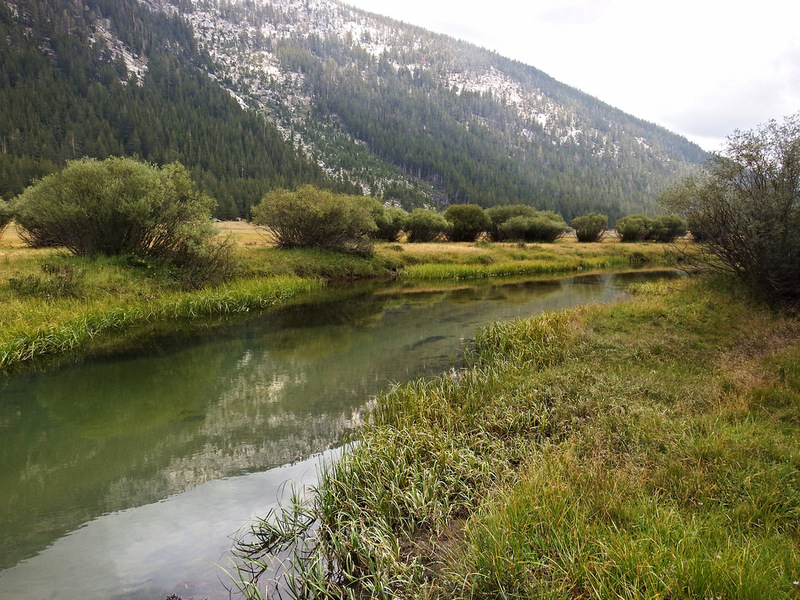 We share this trail with many day hikers but soon after we cross the bridge over the Dana Fork of Tuolumne River the crowds thin considerably and when we enter Lyell Canyon we are once again on our own. Lyell Canyon climbs gently, so gently we feel like we’re walking on a flat ground most of the times. Frequent puddles reflect surrounding trees and clouds and there is a lot of wildlife to see here too. Deer mostly and small mouse like rodents, and nearing the end of the canyon we catch a glimpse of what appears to be a large bear, and what after closer examination ends up being a fisherman dressed in dark clothing waiting by the river with unwavering patience. The end of Lyell Canyon is our home for today. We find a campsite above the trail with a space for two tents and established fire ring. Tomorrow we reach altitude that prohibits fires in Yosemite. And while on a typical warm summer evening I would have little desire to sit by a fire, after several days of feeling cold and miserable I am ready to be warm for once. I even bought a six pack of franks at the Tuolumne Meadows store because bonfire without some kind of sausage just would not be complete. Dave is not sold on the idea at first and even gets a little grumpy when starting the fire in our damp surroundings proves rather difficult but he is cured of all complaining soon after the first batch of franks are ready to be eaten. “Hiker midnight” is a humorous reference to the fact that exhausted thru-hikers find it hard to stay awake past 9pm. Today as tired as we are after a 15 mile day, the fire keeps us up longer.